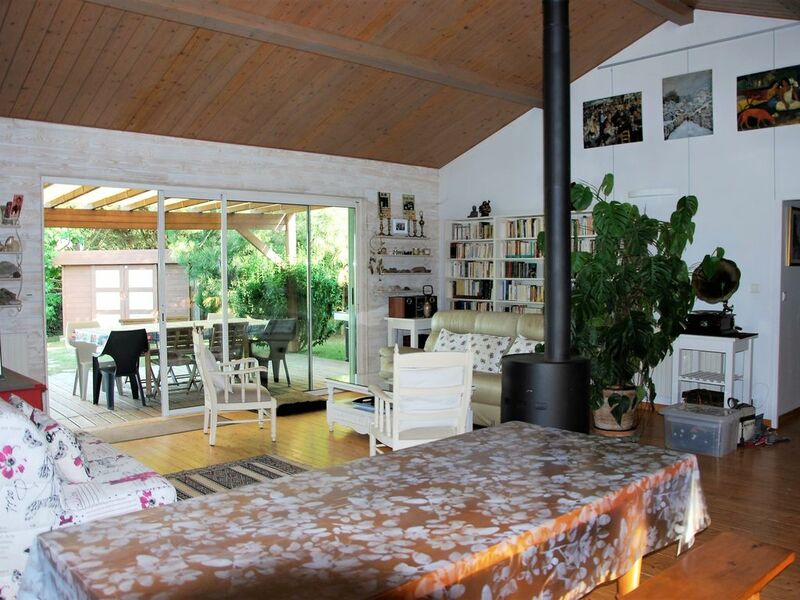 The house of 140 m2 on a plot of 820 m2 is close to Port Bourgenay and the beach of Veillon (1.8 km from one and the other), and is located 10 km from Les Sables-d'Olonne. - the other has a bedroom with a double bed 1.60 m, a bedroom with two single beds 0, 90 m, a bathroom and toilet. You have the possibility to park two vehicles inside the property and you will also find many places available outside (within 50 m). All living rooms (including bedrooms) open with bay windows on the garden and beyond on a natural site without vis-à-vis. Ideal base for hikers, cyclists, swimmers, near the sea and bike paths. Coming from La Roche-sur-Yon on the RN 160, go to the roundabout of the hospital and take the D 949 (the 4th on the right) towards Talmont Saint Hilaire. Road to 4 lanes and 2 lanes. Arriving at Talmont Saint Hilaire, pass the first roundabout from where on the right the bypass of Talmont Saint Hilaire towards the Tranche sur mer, continue to the next roundabout and turn right towards Port Bourgenay by the D4. After the sign "Port Bourgenay - Querry Pigeon", pass a roundabout and continue straight towards Port Bourgenay, then take the street Chèvrefoy (3rd left). The Impasse des Goroncs is the third road on the left just after the football field. Take the bypass of Talmont Saint Hilaire towards Les Sables-d'Olonne. Arrived on the road of Sables-d'Olonne, turn right towards Talmont Saint Hilaire then follow the route indicated above towards Port Bourgenay by the D4. Talmont Saint Hilaire located 10 km south of Sables-d'Olonne, is not only a small seaside resort. It is also a piece of history: the castle of Talmont was indeed the home of Richard Lionheart. During the summer, medieval events with re-enactments are held at the castle. A few miles away, Jard-sur-Mer, we visit the house of Georges Clemenceau, where the Tigre retired in 1919 after the signing of the Treaty of Versailles. But clearly, we come here first and foremost for natural areas. The beautiful beach of Veillon of course, popular with families and kitesurfers and also to discover a remarkable set around the estuary of Payré: forest of green oaks and maritime pines where serpentine forest trails, and oyster beds. We take the opportunity to take a look at the salorge, an old salt granary and meeting point for visits to the salt marshes of La Guittière. Here, we must stop on this small oyster port of La Guittière that we reach by bike paths winding in the middle of salt marshes (7 km from our house through the beautiful village of the High Seas), port where we can taste oysters, seated in front of the Payré estuary. In the immediate surroundings (Querry Pigeon and Port Bourgenay) you will find a small shopping center: fruits, vegetables, seafood, bakery, rotisserie (open at 7am), and a Proxi on the road to Port Bourgenay . A little further, the supermarket Super U located at the entrance of Talmont (3 km) is open every day from 8:30 to 20:00 including Sunday from 9:00 to 12:30. The LDL also located at the entrance of Talmont is open from 8:30 to 19:30 from Monday to Saturday. • Jard sur Mer: every Monday morning from 8:00 to 13:00 place des Ormeaux. • Talmont Saint Hilaire: Saturday morning and Thursday morning Place du Payré. • Port Bourgenay: Wednesday at night from 19h. Bathrooms and shower rooms: • A bathroom with bath / shower, sink, separate toilet attached to rooms 3 and 4 • A shower room with shower, washbasin, separate toilet attached to rooms 3 and 4 And for all of these rooms, two separate toilets. The house must be kept in a reasonable state of cleanliness, the dishes washed and tidy, the refrigerator, the oven and the barbecue cleaned, the hair removed from the shower and bath drain, the sheets and pillowcases placed on the beds, folded towels in the bathrooms, cleaning done with vacuuming and washing floors (under the sink and in the back kitchen, products, buckets, mops, rags are available). If not, we will charge $ 100 to perform these tasks. We can accommodate 8 people over 2 years plus 1 baby for which you will have a cot (sheets not provided for the latter). Finally we are at your disposal and listening to you for a great holiday near the beautiful beach of Veillon. A set of 3 keys (gate, entry house, garage) is given to you on your arrival. Guides, brochures and maps are at your disposal. L’agencement de la maison aura été idéal pour nos deux familles avec jeunes enfants, les pièces à vivre séparant les coins nuit de part et d´autre de la maison. Bien équipée, notamment pour les bébés, nous aurons pu voyager plus légers car nous avions tout ce qu’il nous fallait pour notre confort. L’accueil de Christine et Gérard a été des plus sympathiques, généreux et chaleureux. Ils ont été très disponibles avant, pendant et à l’issue de notre séjour ainsi que pour nous conseiller sur les choses à faire dans la région. Très bien située, à proximité de plusieurs petits commerces où nous nous rendions à pied, la maison nous aura permis de bien profiter des environs, notamment de la plage du Veillon. Nous vous recommandons cette location sans hésitation ! Merci pour votre témoignage. Nous avons nous-mêmes bien apprécié notre rencontre. Très bonnes prestations correspondant parfaitement aux photos fournies et au descriptif. Très bonnes relations avec les propriétaires qui mettent tout en œuvre pour un bon séjour. Plage idéale pour les enfants. Prêts à y retourner. At 1.5 km, the Atlantic Gardens have an aquatic area with heated pool, spa, steam room and treatment rooms. A 2 km aquarium The Seventh Continent allows you to discover the underwater world that people our coast but also the tropical seas. At 500 m, in front of the tourist office, you can rent bikes and cycle through woods and marshes and along the sea.